If someone could tell me how to do so, I could show you folks a picture of the cover--it will be changed in one respect. 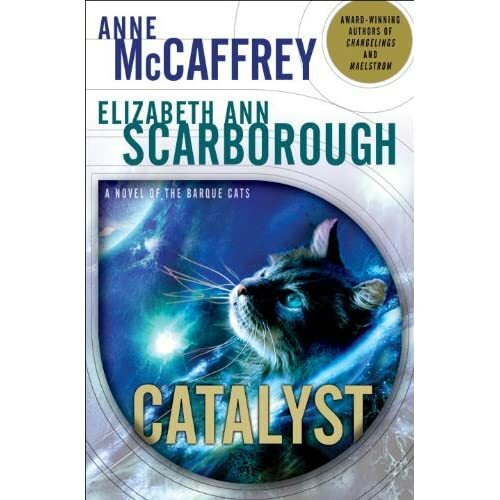 Instead of saying Catalyst, a novel of the Barque Cats it will say Catalyst, a tale of the Barque Cats (which is a better play on words. P'ter, I'm sure you at least will agree having a penchant for puns) Anne likes it too but like me, she's a sucker for a kitty face. Last edited by eann; Oct 2 2009 at 06:03 PM. Eann, I would love to see the new cover, and I'm sure most people on this site would as well. If your cover doesn't already appear on the web you'll need to put it there. If you have an image file on your computer (JPEG format is best) you can upload it to one of a number of free photograph sharing web sites such as http://photobucket.com/ or http://www.flickr.com/. You need to create an account before you can upload pictures. (Beware of the adverts - that's how the sites make their money.) Once your picture is on the site, you can create a link to it using the "insert image" (mountain in an envelope) ikon as described above. You will notice this ikon inserts an "IMG" code into the message window. Some of the photograph sharing sites let you copy and paste an "IMG" code directly, which saves time. Actually (he says remembering the Spanish Inquisition for some reason... ) there are three ways of including a picture here. The third way (if you're not keen on using a third party site) is to talk nicely to Cheryl and Hans and see if they can allow you to create a profile picture like Granath's new baby picture. eann...please try not to worry, if it's up to your normal wonderful standards, no matter how the edit's ends up...it will be wonderful. Just knowing that we'll soon be able to read more about them is exciting news. I'm sure the books will be amazing regardless of the editing process!! I can't wait for them. I loved all your other collaborations (think I used the correct word ) and look forward to this one!! Okay, here is the cover--he isn't QUITE fluffy enough but otherwise charming. This is Chester. Err-sorry about the size. Maybe I should Photoshop it smaller? As soon as we get Catacombs firmly in paw I will be updating my website with this on it too. I'm getting a red x. But I did add the book to my wishlist at Barnes and Noble, so I know it's a great cover. I thought Red-X was a gasolene additive. He's almost a black whole. Okay, P'ter, enough with the puns! Can one have too many? Neither's two too many to confudle. A very good friend of mine wrote her thesis on the subject of "The Mathematical Meaning of 'Some, Few & Many'." Well I'm glad someone defined those, lol. I need help homing Barque Cats! My copies of Damia and The Rowan seem to have migrated somewhere unattainable. Can someone help me with the name of The Rowan's planet and the circumstances of Rascal's adoption? He is on a spaceship right now waiting to go to his new home. Along with quite a lot of other cats. I think the Molly-Daise is going to have to change its name to "the good ship Cat Shelter" pretty soon. Thanks, Cheryl, for the downsize. My computer still shows the ginormous version I posted but for those who got a red X, glad they're able to see the smaller version. No black holes here. Only mouse holes. The planet is Altair. Unfortunately the book is in Delft at the moment (and I'm still in Wales) but he's a present (ish) from the Stationmaster (name forgotten) after Rowan's Pukka is destroyed. I can't remember all the details but I'm pretty sure there were a lot of conditions attached and it was an exceptional circumstance. He was definitely a kitten. If no one else helps out by tomorrow evening I can take a look Sunday/ Monday evening. The stationmaster on Altair is Gerolaman, who (as Edith posts) gives a very young Rascal to The Rowan after her pukha (Purza) was destroyed by a minx called Moira. Said Barquy was from the Mayotte. It is implied at least that the Mayotte is a military vessel. Rascal is described as having patterned tawny fur end with creamy underfur. Itas eyes are silvery-blue and it has seven claws per paw. Gerolaman has to promise the Mayotte that Rascal will be neutered at six months. Rascal deserts The Rowan enroute for Callisto but rejoins her there on her wedding night. Once again I recommend books.google.com as a research aid. It might not give you the complete manuscript, but it at least narrows down where to look since you can search within the book. Incidentally: there was a goddess Damia! DAMIA was the Hora (season) goddess of the fertile earth. The Argives worshipped her together with the goddess Auxesia (Spring Growth), and described the pair as Kretan maidens who received divine status after they were wrongfully stoned to death. What, you don't think Damia had a God complex, do you? Thanks so much for all of this--I need details so ardent fans don't threaten me with flaying alive by seven-clawed paws. Our kittens have the requisite number of toes--they are very very clever. Actually, Rascal is probably playing dumb in the books because these kitties are bred and trained to rule the universe--mewaahahahahahahah, but in a nice furry way. Book 1 is due out on my birthday, March 23, 2010 and book 2 (Catacombs) will be out on the same day 2011. More details about the kitties would be great--whatever anyone remembers or can find. I don't go into the Tower and Hive universe but if one of our beloved kittens ends up there, the crews are gonna talk. Thanks so much for all of this--I need details so ardent fans don't threaten me with flaying alive by seven-clawed paws. The real problem with making these books any part of the Talent universe is that they're contracted with a different publisher. There is usually a "you owe us the next book in the series" clause. These books are standalones that reference the cat characters but really nothing else from the Tower and Hive universe. In fact, probably how we will reference it is have Rascal be sold to the Mayotte for later distribution to the Rowan and company. But our cats don't know any more about her universe than she did about theirs and they have quite a backstory. We have to squeeze everything we wanted to do into the two books so it's a good thing we don't have to reinvent Annie's other universe and meld them. That part of the story's already been told. Yeah, only Rascal was born on the Mayotte as per The Rowan, since he was given to her as a barely weaned kitten. Looking forward to the story! I thought Rascal was one of a litter born on Mayotte? Yup, one of a litter, not the only one. Sorry, I was a bit unclear there. I just wanted to add my input... 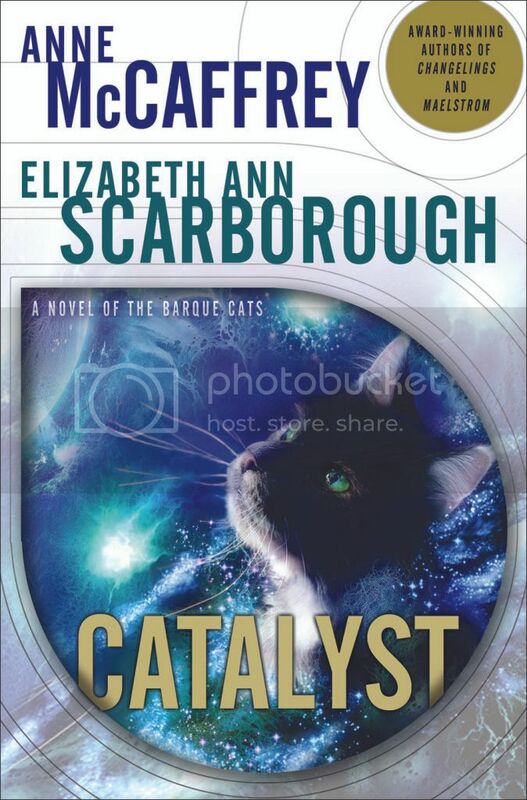 I loved the Tower and The Hive series and I am really excited that there is going to be this addition to those worlds with Barque Cats ! I am a little hesitant since I have yet to read any of Anne's Books that are co-authored and have heard both good and bad things. We'll see right? You haven't read any co-authored books? Have you read any of the Brainship series? Most of those are co-authored; so are three of the five "Planet Pirates" books. So were some of the Acorna series. And the entire Petaybee series.